I actually typed out the following missive Monday last, sitting in the back of our big, old Toyota bus, parked beside our B & B in Blackpool, with the sunroof open (although for some unknown reason, I believe it's called a "moon roof"?) and the sun beating down upon my bonce, not because I wanted a tan particularly, but because I would have never finished my column sitting inside our hotel room, deprived of the positively essential fag in hand. However you'll have to forgive me for failing to post it out (either that or buy yourselves a copy of Wednesday's edition of the Irish Examiner, you tight-fisted buggers! ), as I was so desperate to get it finished and make the very most of the sunshine, before the good weather broke and Blackpool's Golden Mile became a bleak, grey, rain and wind swept vista only to be viewed from behind the comfort of our sea-view window. Fortunately, although the weekend heat wave was well and truly finished, we did at least enjoy several sunny interludes as we lingered by the seaside until Wednesday night. But so as to boost next week's paltry pay packet after taking a few days off, I ended up working all hours Thursday and Friday and as a result (somewhat inspired after savouring the end up Man Utd's treble hopes this afternoon), this is the first opportunity I've had to open up my laptop. Having never before tasted the delights that Blackpool has to offer - which are marvelous so long as you are able to survive on a strict fish/chips, hot dogs & burgers diet - we decided to head down there in the wee hours of Friday night/Saturday morning, in the hope of missing the worst of the weekend traffic. Best laid plans and all that, as I pulled over for an urgent caffeine hit at Newport Pagnell services, only for the Toyota's battery to expire without warning. Despite this unexpected additional hundred quid cost to our "cheap" break, I was delighted when an obliging AA man got us back on the road before too long, as when I first turned the key in the ignition, my heart sank when the old bus failed to fire up, as I had visions of the cause being something far more terminal and our weekend away being over, before it had even started. 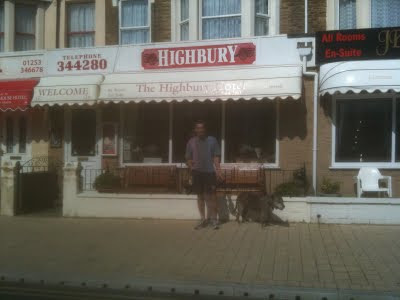 As a result, I suppose being somewhat paranoid of a repeat episode, I didn't stop again until we pulled up outside our "dog friendly", seafront hotel. Whereupon pointing her snout towards the sea-breeze and tasting the salt air, Treacle was positively straining at the leash for a gallup down on Blackpool's vast beach. Either that or the poor mutt was desperate for a "pony" after five hours cooped up in the back of the bus! 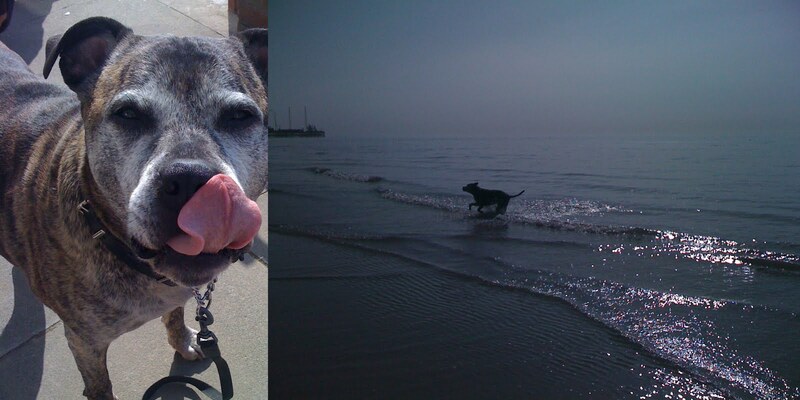 It was worth the long schlep just to see Treacle shedding her advancing years as she cavorted amongst the waves (although the ice cold waters of the Irish Sea must be guaranteed to kickstart the most faltering heart) and while Treacle drip dried during a brief walk along the seafront, we soon discovered we'd missed out on a home from home. Then again, you would imagine that this was one weekend during the football season when Blackpool's Highbury Hotel would be fully booked. There was also a welcome at the seaside waiting for us at a local confectioners. I thought it was an expression of fondness for the Gunners football until I realised that the sign stating "Arsenal Rock" was advertising souvenir sticks of rock for visiting Gooners. 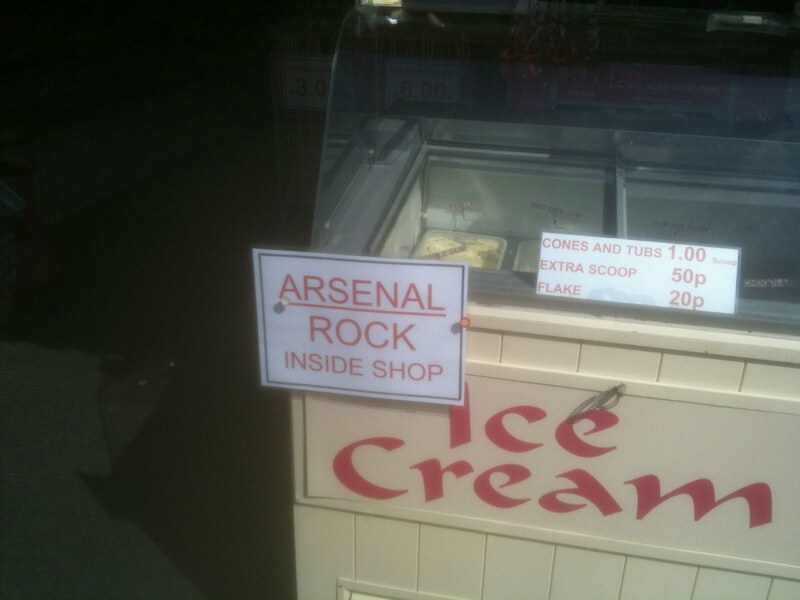 I meant to return to buy a stick or two to bring back (as obviously a stick of Arsenal Rock is the one thing missing from my collection of Arsenal everything else!). But when I next passed by it dawned on me that this particular seaside entrepreneur must've produced nineteen similar signs, as by Wednesday the same shop-keeper was flogging "Wigan Rock"! Róna jokingly pondered whether perhaps the Highbury Hotel had similarly interchangeable signage to cater for the visiting fans from all the other Premiership clubs? 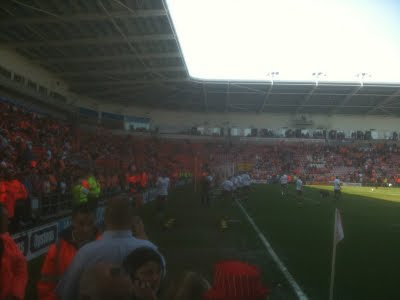 Meanwhile we were still in Blackpool when the news came in of Danny Fiszman's tragic demise and I see that the club have renamed the two bridges at the ground, one in honour of Fiszman and the other in honour of Ken Friar (I'll have to check it out this afternoon to see which one is which). Ken Friar has been an incredible servant to the club his entire working life, as the public face of the Arsenal for as long as I can remember. He was due to retire just before the move to the Emirates and was persuaded to stay to see the project through. But you get the feeling now that the only way Ken will leave his post at the Gunners will be in a wooden box (and even then, he's been such a part of the fixtures and fittings that he'll doubtless come back to haunt the place). There's no doubting the fact that Fiszman is due plenty of credit for all the effort he put into turning the Emirates project into a reality and I don't like to badmouth anyone when they can no longer answer back, but I speak as I find and while I can recall occasionally seeing Fiszman on our travels around England and Europe (on the rare occasion I found myself wandering into First Class), compared to David Dein who we always seemed to bump into wherever we went with the Gunners, I never got the sense that Danny was quite as dedicated a Gooner as Dein? Although I suppose it depends on how you measure this because while Fiszman might not have found the time to travel to quite as many away games (although I don't really know this for a fact, as for all I know he could have travelled by private jet/helicopter), judging by the deal done with Stan Kroenke for his Arsenal shares, it would appear as if Fiszman was taking care of Arsenal business on his bloomin' deathbed? The again perhaps he was just looking out for the future of his own family by cashing in on his investment. Back on the pitch, with the imminent return of Sczczny (thank heavens!!) and the news that Thomas Vermaelen is back in full training and might well return before the end of the season, I'm suddenly feeling somewhat more optimistic. But with the Scousers this afternoon and Spurs on Wednesday, we won't have long to wait, to find out just how hungry the Gunners are for the run-in. With Liverpool coming to us buoyed by their 3-0 win against City, with Carroll and Suarez both beginning to find their feet, I reckon it might be an "interesting" afternoon! In light of the way in which the Gunners campaign has petered out in such a pitiful fashion these past few weeks, I don’t think there are too many Arsenal fans who truly believe that the 3 points secured against Blackpool on Sunday has put us back in the title picture. Still, without a win since our walkover against humble Leyton Orient six games back, it was at least good to finally return to winning ways. Although, much like most other footie lovers, I sincerely hope Sunday’s defeat for the Seasiders doesn’t prove crucial in their increasingly desperate bid for Premiership survival. 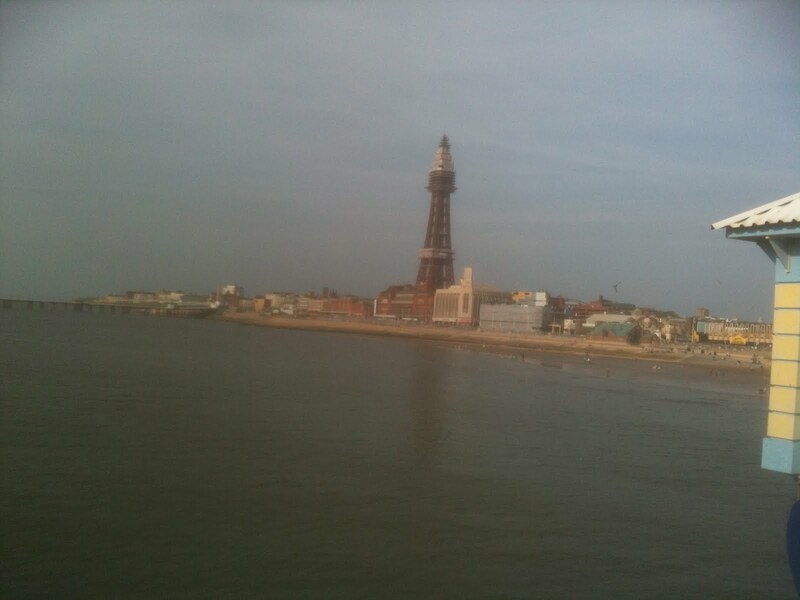 After having spent an absolutely gorgeous weekend soaking up the sun, strolling up and down the glorious sandy beach of Blackpool’s Golden Mile, I will be absolutely gutted if such a pleasurable excursion doesn’t become a regular part of the awayday calendar. That is, so long as the fixture scheduling gods can guarantee us a return every season in the late spring or early autumn sunshine - I assume Blackpool is not nearly such an attractive proposition set amidst the backdrop of a bleak mid-winter. Albeit that the novelty of a sea breeze blowing across the terraces sure beats various alternative outings in the more traditional heartland of the industrial North-West. With the sun on the backs of our fairweather stars, I quite fancied us to turn on the style on Sunday. But then Blackpool should’ve been dead & buried by the break and our profligacy in front of the Seasiders’ goal, which proffered Ian Holloway the opportunity to fire his troops up for an admirable attempt at a second-half fight-back, just about epitomized the soft-centred box of chocolates, the crucial absence of the Gunners’ killer instinct, that once again seems destined for Arsène to end up empty-handed. Not that I don’t fancy Fergie’s particularly uninspiring vintage to slip up again during the run-in. But should Man Utd leave the Premiership door ajar, in their pursuit of European glory, neither myself, nor many other Gooners have much faith in the Arsenal’s ability to gain the sort of momentum that would enable us to kick it down. There was little sympathy for Almunia on Sunday. Contrast our Spanish keeper’s withdrawal from the game with a 40-year old match report in the local gazette the previous day, which told of Blackpool’s brave keeper playing on with a broken arm! The lunatic that is Jens Lehmann might be no less prone to glaring gaffes, but at least he has the redeeming quality of being a big, imposing unit and there’s nothing timid about any of his antics. Ref Mason might’ve made the contest more interesting if he’d sent Lehmann off. At least for comedy value alone, we might’ve witnessed Nick Bentdner’s big-head filling the goalmouth. Meanwhile, with the voracious corporate vultures having been circling the club for so long now, I suppose it was only a matter of time before “Silent Stan” was forced to pounce on his prey (with Kroenke’s hand seemingly forced by the Uzbek gangster’s recent share activity). For now, we can only speculate upon the eventual impact of the Arsenal’s almost inevitable transition towards private ownership. Personally I am quite optimistic, as one gets the sense that some sort of change is vital, in order to spark a shake up of a somewhat stagnant boardroom, where upward financial, or commercial mobility has become the principal focus of a cozy and increasingly elderly collection of suits, who are all too comfortable with the Arsenal’s lot, preferring to stick with Le Prof’s safe bet, rather than risking going “all in” on the roulette wheel of football’s quest for the glittering prize. Back in the day, before we departed Highbury, I would’ve been devastated by the prospect of the Gunners going down the same road as so many other Premiership clubs, by selling our soul to some foreign devil. But that was when owning a share of the Arsenal was about far more than money. It was about the feeling of pride engendered by a framed share certificate that proved you were part of our beloved club. There’s no room for such sentiment in the ruthless corporations that have become of our ancient institutions nowadays, where fans are nothing more than anonymous figures on a balance sheet. Shareholders’ trusts might be a thoroughly admirable attempt to keep football in the family, but in truth they are little more than an irritating fly in the corporate ointment. Despite the amazing impact of “people power” across the political landscape of the Middle East, I think it’s naïve of us to believe we can have anything more than a token influence in the way our clubs are run nowadays. Or at least so long as there are thousands more bums than there are seats at glamorous clubs such as ours. As Arsenal fans we can do little more than sit back and watch the corporate hand play out, while hoping that ultimately it has a positive impact on the pitch. In some respects we are not that different to Blackpool and I’m sure that much like Ian Holloway we’d gladly sacrifice our tag of being an entertaining side that everyone loves to watch, on the altar of becoming the club that everyone loves to hate!